A trek for athletic hikers, along crests offering stunning views for the Cirque of Cilaos and the beautiful setting of the Entre-Deux village. Here, toponymy is mysterious: hiking trails are named Le Zèbre (The Zebra), La Grande Jument (The Big Mare), the Bayonne path... As for the Dimitile Crest, it was named after a “marron” (run-away slave) leader at the time of slavery. Today, this area is essentially planted with geraniums, from which quality essential oil is extracted. Rate upon request above 5 participants. D1 – Along the Bayonne path, we walk along the rempart that overhangs the Bras de Cilaos (main river of that cirque), until the Dimitile Crest. 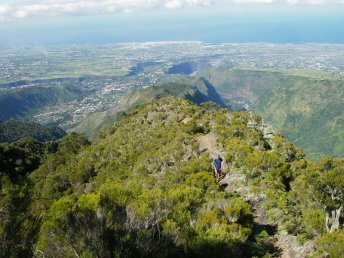 At all times during the hike, spectacular views of the Cirque of Cilaos and of the south coast behind us. D2 – Descent to the Entre-Deux village along the Zèbre or Grande Jument path. Crossing of the different vegetation levels. Tasting of goyaviers - a small fruit of the guava family - along the way (from June to August).